Ramblings of a multi-tasker: I am loving life right now! I will be honest with you. I’m a little bored of the negative facebook status updates and tweets I have seen throughout today. People moaning about the holiday being over too quick, back to work tomorrow and whatever else they can find to be miserable about . Blah blah blah! Life is too short. I am completely understanding of the ‘back to school’ feeling as I still get Sunday night fear every week but I am pretty sure there are plenty more positive things we could all be saying. I am going to buck today’s trend, be different and tell you all why I’m loving life. On New Year’s Day 2010, my boyfriend and I were walking back to my best friend’s house in Sheen to collect our car and we had serious New Year’s Eve induced hangovers. I grew up in SW14 and I still have a special place in my heart for South West London. At the time we were living in the sticks out near Heathrow. I was keen to move back. My friends are here, my family are here and I just love the area but I didn’t want to be seen as the bossy girlfriend that moves her boyfriend to live next door to everybody in her life. Much to my delight when I asked Jon what he thought of the area he declared he would quite like to live here. Green light! By the time we’d rocked up to Lucy’s we had given ourselves 6 months to find a new home in Mortlake or Barnes. Wahoo! 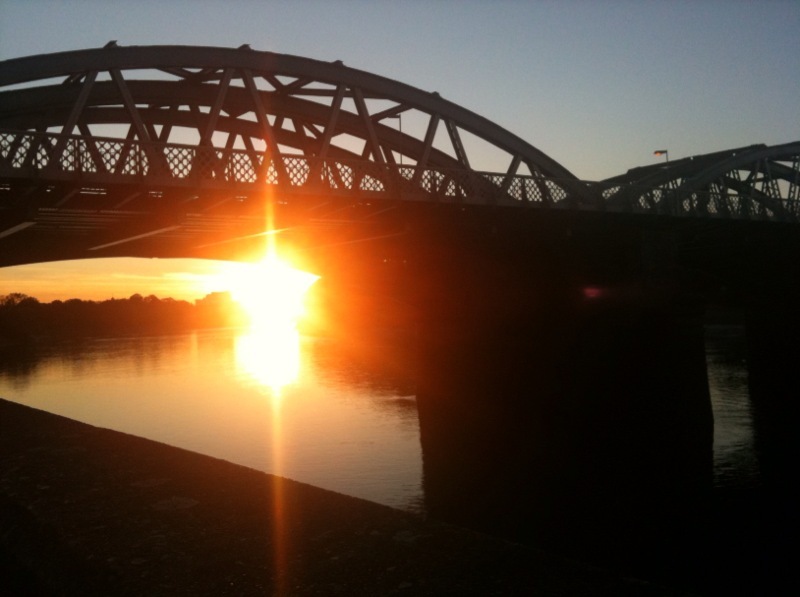 We moved to Barnes in May and it’s the best thing we have done in a long while. Running gives you a lot of time to think and whilst out on my day 3 Janathon run I had a little think about why I love Barnes. There are so many things that I like it would be really hard to say it all in to one post. Here are just a few of the things that helped me through my super painful 6k run today. I love being close to my friends and family in amazing surroundings. When it snowed I went to Richmond Park with my sister, boyfriend and niece. Richmond Park is beautiful and is one of my favourite places. If you haven’t been then go. The Isabella Plantation is just amazing in Spring time. I’ve put some of our Richmond Park snow pics below. 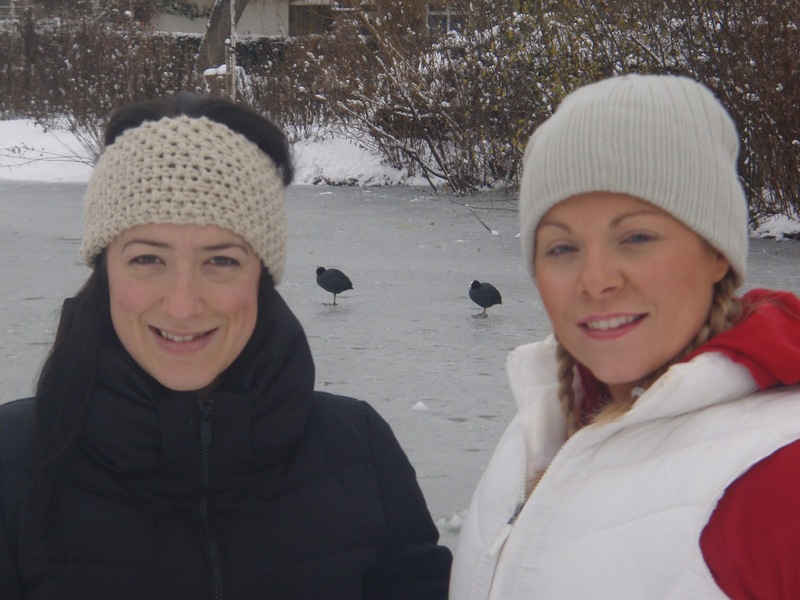 I love living close to Barnes pond and to my best friend Lucy. 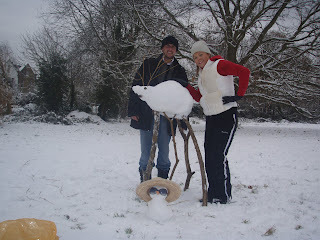 We also took advantage of the snow and hung out at Barnes Pond to build a snow deer with her husband Paul. I like to be different! Excuse the ugly stain down my jacket. Among the excitement, I managed to spill coffee all down myself. Ihave mentioned before that I am a bit of a secret geek. I’m a wanna be birdwatcher (yes,really) so any opportunity to do a bit of twitching I’m there. Check out the coots between Lucy and I. If we met it's probably not the first thing you'd guess was a hobby of mine. When I was running today, I have to admit I did have to stop to stretch my poor legs. They were screaming at me by the time I got to the Mall in Chiswick after 5 days of running. In fact they were screaming at me before I even left home. I was going to go out straight after breakfast but my bed was too much of a temptation. It was my last chance for a lay-in so lay in I did and finally set off at 1:00 this afternoon. Today’s run was tough but I kept telling myself how lucky I am to have the opportunity to run in such a beautiful area. Below is Barnes Bridge where I start my run and the other picture is one I took today when I reached Hammersmith Bridge. This is the halfway point in my 6k run and when the bridge comes into view it makes me smile. 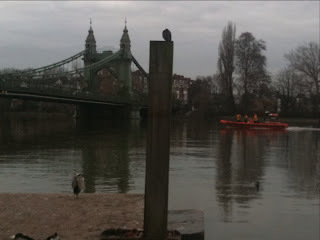 When I saw the Heron I just had to stop to take a snap. I kept on straight away though with no walk breaks but I have to admit it was really hard. When I got to Lonsdale road that runs parallel to the towpath, I was so close to stopping for a break but Stonebridge, Put ‘em high came on my I-Pod. It’s Lucy’s favourite song and gave me the boost I needed to power on through. I felt so good when Barnes Bridge was in sight and when I finished I took a moment to just sit and look at the river. Despite my sore muscles I was beaming from ear to ear. 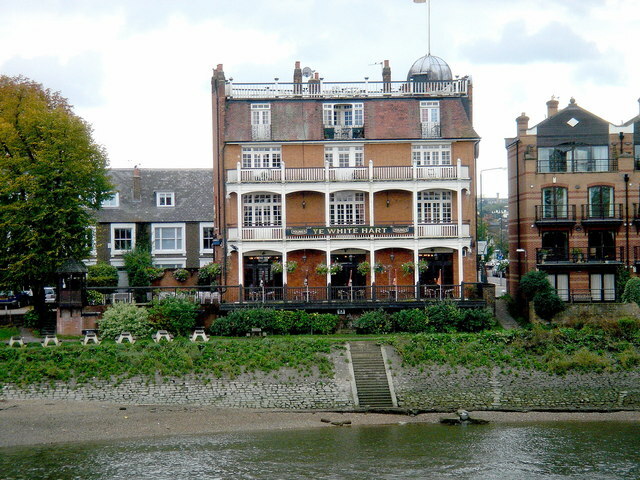 When you glance to the left of Barnes Bridge you see the White Hart Pub. I think it's actually officially called ye White Hart but I feel a but stupid saying that. It’s a fab pub and they are on Twitter too. (@WhiteHartBarnes) Barnes has some great pubs that are brilliant for catching up with friends and I even managed to get my Mum and Dad down to the White Hart with my sister and friends on Christmas eve to have a birthday drink with me. 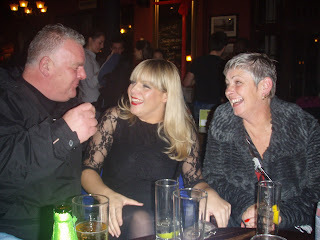 Mum and Dad aren't your typical pub type so it was great to have them there. Being a wanna be twitcher I love that the London Wetlands centre is just down the road from where I live. I persuaded Jon to come for a walk there this afternoon as we are actually members. 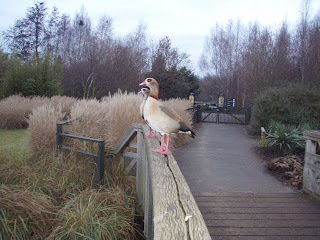 It really is incredible that such a nature reserve exists in London and we saw swans, diving ducks and even a crane. They have an ‘introduction to birdwatching’ course in February and I am seriously tempted.Despite my two bird handbooks, my twitcher knowledge is just not up to scratch. I love living in a place where you know people in the community. When out and about I normally bump into somebody I know. Despite being in London, Barnes has a real village feel. We even have a farmers market on a Saturday and it’s quite likely you’ll catch me there salivating over the amazing food. 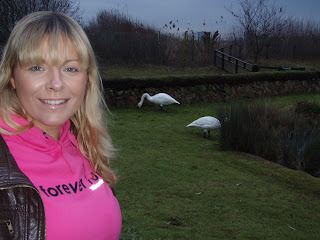 After the wetland centre walk today I bumped into one of the Team Bangs on the Run girls out on her run. Gemma was going for it. Another thing I love is seeing people with a target and working hard to acheive it. Seeing all the the Team Bangs on the Run updates and faboulous support we have receivedso far has been great. Thank you to everybody that has supported us and donated so far. We really do appreciate it and it is definitely helping me with my training. Another thing that I am loving right now is my Kindle that was a joint present from my brother and sister. It is amazing! I love the way that that you can turn the pages at the click of a button even when you are holding it in just one hand. The final thing that makes me really happy is that despite being ill for most of it, I managed to have a brilliant Christmas spending time with our friends and family. I even managed to squeeze in a 'Christmas day' dinner with my friends on 28th December. I could go on and on here about things that I love but I think this is enough love for one post. Come on guys, before you post another miserable and negative status have a good hard think. I don’t want to sound preachy but there will always be somebody that is in a more unfortunate position than yourself. Think of something positive to say, embrace life and if you are unhappy then try and change things for the better. loving the positivity girl! its so true, there are people out there with real problems to deal with on a day to day basis, people need to count their blessings! At least they have jobs to go to! Also loving the running descriptions; thats the joy of running outside, so much to marvel about when your legs are screaming and cursin you! Thanks for all the lovely comments ladies and Katy, Barnes is fab! Be sure to let me know when you move and we can mosey around the farmers market. Bring Clare along too as despite emails, tweets, facebook posts & phonecalls we've never actually met! "I'm loving life right now" made me smile before catching some shut eye, so thanks for that luv! 2011 is all about staying positive for me, positive on life, love, work, friends so its great to be readin such a post so early into the New Year. Well done on blogging my lovely, I'll defo be adding you to my blogroll! P.S. Apologies for any typos, I'm on the crackberry in bed and can't see nada!